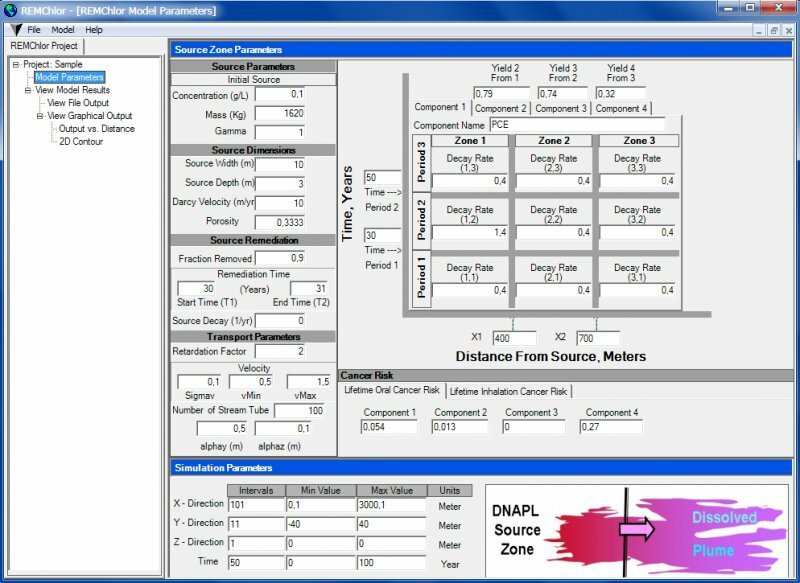 REMChlor, or Remediation Evaluation Model for Chlorinated Solvents, is an analytical solution for simulating the transient effects of ground water source and plume remediation. In the analytical method, the contaminant source model is based on a power-function relationship between source mass and source discharge, and it can consider partial source remediation at any time after the initial release. The source model serves as a timedependent, mass-flux boundary condition to the analytical plume model, where flow is assumed to be one dimensional. The plume model simulates first-order sequential decay and production of several species, and the decay rates and parent/daughter yield coefficients are variable functions of time and distance. This approach allows for flexible simulation of enhanced plume degradation that may be temporary, limited in space, and have different effects on different contaminant species in the decay chain. Health risks posed by carcinogenic species in the plume are calculated that the contaminated water is used in a house for drinking, bathing, and other household activities. * REMChlor download link provides freeware version of the software. Could not get REMChlor to run. Please help. Thanks. No one has rated REMChlor yet. Be the first to rate this product.